The crypto markets retracted this week, with ethereum and many altcoins posting declines greater than 10%. The bitcoin price, however, swam against the current to return a weekly gain of 3%. Bitcoin’s climb was not enough to prop up the total crypto market cap. The total value of all cryptocurrencies fell from about $95 billion a week ago to $89 billion on July 31. The Bitcoin Cash hard fork is just hours away, but the bitcoin price continues to climb. In the past day, the bitcoin price has risen nearly 5%, crossing the $2,800 mark to reach its present value of $2,802. Bitcoin now has a market cap of more than $46 billion and a commanding lead of nearly $28 billion over ethereum. 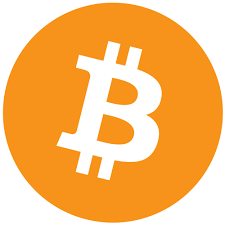 One potential reason for the bitcoin price climb is that since Bitcoin Cash is forking the Bitcoin blockchain, bitcoin holders will receive a bitcoin cash “airdrop” correlating to their balance on the original blockchain. Bitcoin Cash futures are trading below $300, but it is not known what the price will be when the actual coin debuts. Investors could be looking to sell Bitcoin Cash for a quick profit, or they could genuinely believe the forked coin has a chance to disrupt the markets. July was not friendly to ether holders. The ethereum price posted a month-long decline, falling below $200 after entering the month above $280. In the past week alone, the ethereum price has declined by nearly 14% to its present value of $196. At $18.3 billion, ethereum’s market cap is now less than 40% the size of bitcoin’s. Normally, bitcoin price increases have a correlative effect on altcoins. This week, however, altcoin prices hemorrhaged even as bitcoin posted gains. Counting ethereum, six coins in the top 10 declined by more than 10% during the last week of July. The ripple price led the retreat, sliding 2% for the day and 16% for the week. Ripple ends July with a market cap of just $6.3 billion after beginning the month at about $10 billion. The altcoin market pullback reduced the litecoin price to $39 for a weekly decline of 11%. Litecoin’s market cap sits just $54 million above the $2 billion threshold. The NEM price weathered the storm better than most coins, holding steady at $0.165 for the day and declining 2% for the week. The Dash price dropped to $171 for a seven-day decline of 16%. 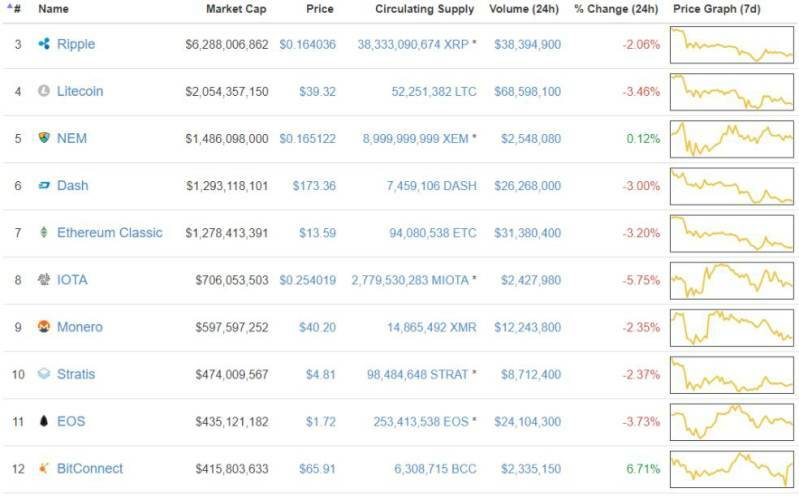 Ethereum classic, whose market cap is just $15 million below that of Dash, could not capitalize on the opportunity to pass Dash in the rankings. The ethereum classic price fell 3% for the day and 14% for the week. The IOTA price dipped by more than 5% on Monday, reversing the progress it had made earlier in the week. It currently sits at $0.254. Monero and EOS both experienced moderate declines, while the Stratis price plunged by 20% for the week. Twelfth-ranked BitConnect was the largest coin other than bitcoin to post positive weekly returns. Bolstered by a 7% daily increase, the BitConnect price rose to $66. The Bitcoin Cash hard fork has yet to take place, but futures have been trading on ViaBTC for more than a week. Traders could obtain BCC futures (this symbol is not standardized across all exchanges) by temporarily freezing BTC on the exchange. Since its listing, the bitcoin cash price has experienced a steady decline. The bitcoin cash price began the week at about $550 but has fallen below the $500, $400, and $300 thresholds. At present, CoinMarketCap lists the price of bitcoin cash futures at $278. Bitcoin absorbed an additional 4% of the total market cap this week, increasing its share from 47.4% to 51.7%. 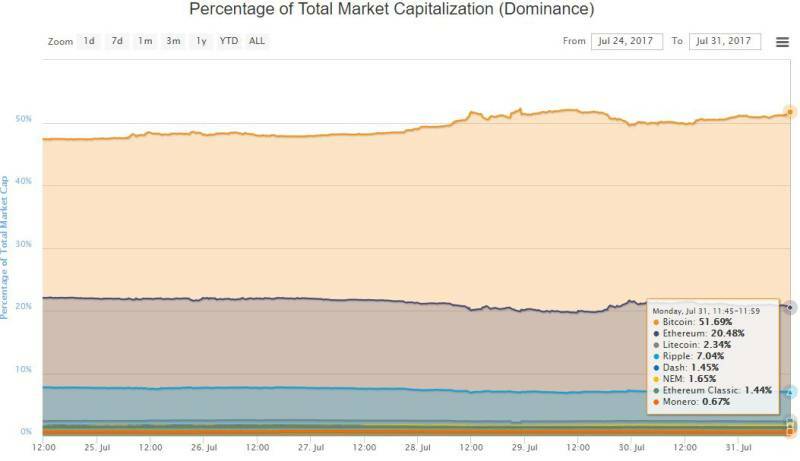 Bitcoin dominance has now surpassed 50% for four consecutive days, a feat it has not accomplished since May. BItcoin’s Market Share Now Surpasses All Other Cryptocurrencies Combined. Chart from CoinMarketCap. Ethereum’s market share has declined from 22% on July 24 to 20.5% on July 31. Ripple’s slice, meanwhile, has fallen to 7%.